This article is about the search engine. For other uses, see Bing. 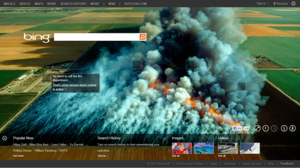 The Bing homepage has an image that changes daily. Bing is the current web search engine from Microsoft. Unveiled by Microsoft CEO Steve Ballmer on May 28, 2009 at the All Things Digital conference in San Diego, Bing is a replacement for Live Search. It went fully online on June 3, 2009, with a preview version released on June 1, 2009. In its first few weeks Bing was successful in gaining some market share. Notable changes include the listing of search suggestions in real time as queries are entered and a list of related searches based on semantic technology from Powerset, which Microsoft purchased in 2008. Bing also includes the ability to Save & Share search histories via Windows Live SkyDrive, Facebook and email. On July 29, 2009, Microsoft and Yahoo! announced a deal in which Bing would power Yahoo! Search.